Raw Data: Who Pays Federal Taxes? I’m writing regarding an often repeated refrain that the top 10% of income earners pay 70% of all income tax. This looks big when compared to their 50% share of total income, but I know this ignores payroll taxes. I have not been able to find a good online breakdown of how payroll taxes paid by individuals changes this. Could you refer me to some sources if you know? Well, why not? The Congressional Budget Office has a nice page here that provides lots of useful tax and income share data. The table below is combined from their income share document and their tax share document, and it shows the share of all federal taxes paid by different income groups (their latest data is for 2006). Their definition of “income” is quite broad, including healthcare benefits and federal welfare benefits. 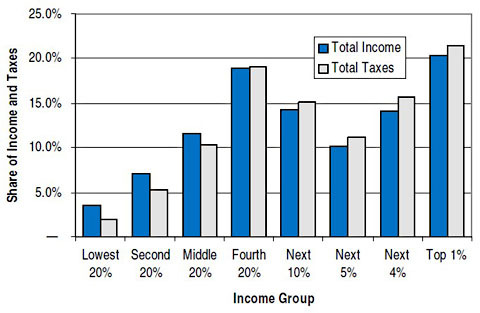 As you can see, the top 10% receive 41% of total income and pay 55% of total taxes. In other words, the federal tax system as a whole is progressive, but it’s not very progressive. Add in state and local taxes and things get even less progressive. But for federal taxes only, this is the basic story. UPDATE: Via Citizens for Tax Justice, here’s a similar chart that accounts for all taxes — federal, state, and local. The income groups at the high end are arranged a bit differently than CBO’s, but the basic comparisons are the same. As you can see, the total tax system in America is only very slightly progressive.